The Collection of Maps contains more than 600 items. Among the most important is the map of the Kingdom of Serbia, by Giacomo Cantelli (Il Regno della Servia, detta altrimenti Rascia), published in Rome in 1689 in the famous workshop of Giacomo de Rossi. This is the best map of Serbia in the 17th century, which, on account of the richness of topographic detail and other properties, is considered to be the milestone in the geographic representation of Serbia. Several maps of Serbia and the Balkans in the 18th century, and plans of Belgrade from the same period, testify to the increased interest of Western Europe in the southeastern part of the continent, which, until then, had been mostly inaccessible not only for the more sophisticated but even for elementary geodetic measurements. As the declining Ottoman Empire was not interested in cartography, travelers from Christian Europe usually joined diplomatic and trade missions, taking the major roads to Constantinople. With the Austrian penetration into the Balkans, and a series of wars against Turkey after the Ottoman defeat at Vienna, the interest in the Balkan war theatre and in the detailed cartographic processing of the area increased. The Map of Serbia and Bosnia, with a series of panoramas of Belgrade, Šabac, Vidin, Niš, Sarajevo and other major cities, which was the work of the famous Nuremberg workshop of Homan’s successors in about 1730, stands out for its baroque impressiveness. From the same period are the plans of Belgrade by De Fer and Matthäus Seutter, the doyens of German and European cartography. Although the late 18th century saw cartography transforming into an exact science, precise surveying of the entire territory of Serbia did not occur until the second half of the 19th century. That is why the map of Serbia made by Austrian Captain Adam Weingarten, printed in Vienna in 1820, has been given particular importance. Also significant is Russian map of Serbia of 1831, by Kotzebue, in which the country’s borders, obtained by measurements on the spot and with appropriate instruments, were outlined for the first time. 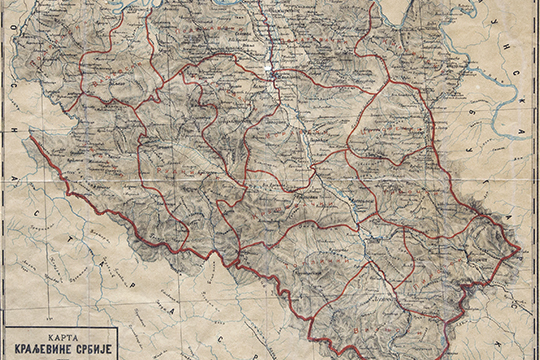 Of maps made in the 19th century, the Historic-ethnographic-geographic map of the Serbs by M. Milojević, from 1873, is worth mentioning for its romanticist perception of the national history, and for the undoubted influence it exercised. 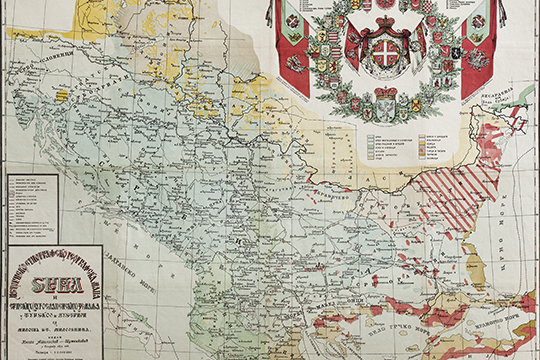 The standard map of the Kingdom of Serbia by Vladimir Karić, from 1888, was indispensable in the schools and various institutions of the late 19th and early 20th centuries. Different administrative recompositions of the Serbian living space in the 20th century were corroborated by numerous maps of the Kingdom of Serbs, Croats and Slovenes, as well as by those from the period of the Kingdom of Yugoslavia, and afterwards the Federal Republic of Yugoslavia, i.e. the Socialist Federative Republic of Yugoslavia.